LOWELL, MASS. - Baseball is back at LeLacheur Park in a pre-season feature as the Lowell Spinners season approaches. The Spinners, in conjunction with Acton Boxboro High School Varsity Baseball Team, will host the American Cancer Society's Coaches vs. Cancer exhibition between the Colonials and the visiting Easton (Penn.) Rovers at 6:30 p.m. Saturday, May 12. 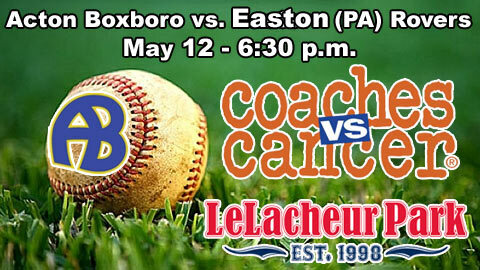 The game will be played under the lights at LeLacheur, starting with a pre-game tribute at 6 p.m. The game holds a special significance to the Acton community and is the first ever baseball game for the Coaches vs. Cancer Classic after a number of other events last winter. The game will honor a former AB player, Brian Fowler, who passed away after a battle with leukemia after graduating. Brian's father, Charlie, who provides a yearly scholarship in his son's name will be in attendance with many of Brian's family and friends for a special pre-game tribute. "As an organization we are committed to being the community team," said Spinners President and General Manager Tim Bawmann. "This is an incredible event to get behind and we are honored to host it at LeLacheur Park." Admission to the game is $5 for adults and $3 for students. Children 10 and under and Senior Citizens are admitted free of charge. The concessions stands will be open and a special silent auction of sports memorabilia will take place during the game with all proceeds benefiting the American Cancer Society. Coaches vs. Cancer is a nationwide collaboration between the American Cancer Society and the National Association of Basketball Coaches (NABC) that empowers athletic coaches, their teams, and local communities to make a difference in the fight against cancer. The initiative leverages the personal experiences, community leadership, and professional excellence of athletic coaches nationwide to increase cancer awareness and promote healthy living through year-round awareness efforts, fundraising activities, and advocacy programs.